If you are Googling “plumbing problems Maricopa“, you most likely are experiencing a plumbing issue and need the help of a plumber in Maricopa! If this is your situation, give Jason the Plumber a call today at (623) 734-8072 or (480) 834-3373. Everyone has plumbing issues every now and again and it can be stressful to not know what’s going on. 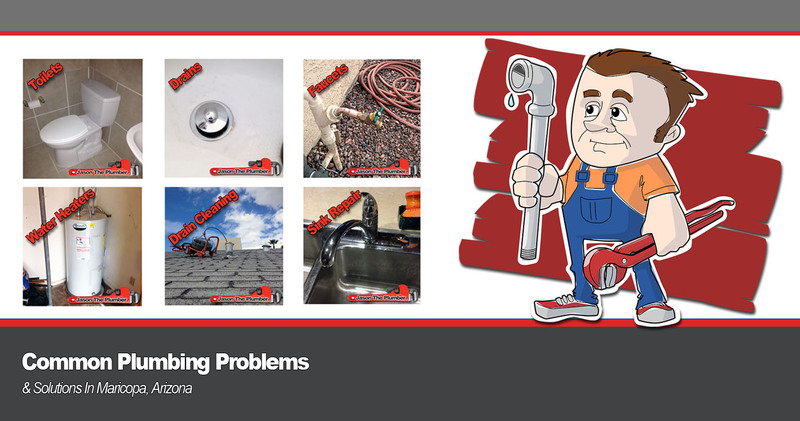 Here we list the top 10 most common home plumbing issues in Maricopa. We also offer plumbing services to repair your plumbing issues. Just about any homeowner has had a dripping sink or faucet in their home and most likely just let it go unrepaired. The dripping faucet is a problem and is wasting 100’s of gallons of water per year. Not only that but no one likes to hear a constantly dripping sink all night long. Think that drip isn’t costing you must money. Use this drip calculator to determine how much money you are actually losing due to your dripping sink faucet. Solution: If you are looking for faucet repair in Maricopa, Schedule Faucet Repair Services with Jason the Plumber Today. Most water leaks come from leaky pipes that were frozen over the winter months. Although, in Maricopa, Arizona, it doesn’t really get too cold, rather, it gets too hot. Many water pipes in hotter areas begin cracking at their joints due to the heat. Keep your eye out for wet spots on the ceiling or coming from behind the walls. Water damage can be expensive to repair so if you have some type of water leak it is wise to fix a leaky pipe right away! Solution: If you are looking for water leak repair in Maricopa, Schedule Water Leak Repair Services with Jason the Plumber. A toilet that is constantly running will waste anywhere from 150-200 gallons over a year. That is a very expensive flush and a lot of water to waste. This blog from Angie’s List goes over how expensive a toilet water leak can be. What can cause my toilet to not stop running? “A common reason why the toilet won’t stop running long after the flush is the flapper valve”, says One Call Plumbing Services. Solution: If you are looking for toilet repair in Maricopa, Schedule Toilet Repair Services with Jason the Plumber. A lot of older homes in Arizona have lower water pressure than newer style homes. You may have a hidden water leak or it may just be time for newer sink faucets or shower heads. Although, those problems are just a couple of low water pressure problems. Solution: If you are looking for low water pressure repair in Maricopa, Schedule Water Pressure Repair Services with Jason the Plumber. Hose bibbs can leak from time to time after an extremely dry summer in Maricopa. You hose bibb will start to crack and then begin leaking water. It is wise to spend money on a higher quality hose bibb that will prevent water leaks. Solution: If you are looking for hose bib repair in Maricopa, Schedule Hose Bib Repair Services with Jason the Plumber. Most people think that all you have to do to a clogged drain is use a drain cleaner. Although, this is one of the worse things you can do to your drain. Drain cleaners are harmful to your pipes and can degrade them. You should always call a professional plumber if your drains wont drain at all or are draining extremely slow. Sink drain and shower drains clogged with hair are usually the culprit. Solution: If you are looking for drain repair in Maricopa, Schedule Drain Cleaning & Repair Services with Jason the Plumber. Rain is usually the cause of a sump pump failure but there are other reasons your sump pump could fail as well. Since we don’t receive much rain in Arizona, it’s most likely not due to that. If you are having sump pump problems, you should call a licensed plumber right away to avoid further damage. Solution: If you are looking for sump pump repair in Maricopa, Schedule Sump Pump Repair Services with Jason the Plumber. No one wants to wake up to a cold shower or no running hot water. If your water is not getting hot, it could be time for water heater repair or replacement. A water heater’s average life is about 8-12 years depending on if it has had maintenance performed on it or not. If your water won’t heat up or is only getting a little hot, you definitely have a water heater problem. Solution: If you are looking for water heater repair in Maricopa, Schedule water heater repair services with Jason the Plumber. Sewer lines tend to clog because of water back up or a clogged plumbing drain. Sewer clogging will make a gurgling sound that you will most likely notice coming from your sink or shower drain. Other noticeable signs of sewer line issues include water backing up in your shower after flushing the toilet, toilet bubbling or gurgling water sounds coming from your faucet spout. Solution: If you are looking for sewer line repair in Maricopa, Schedule sewer line repair services with Jason the Plumber. Garbage disposals are probably the most common plumbing problem homeowners or business owners experience in Maricopa, AZ. Solution: If you are looking for garbage disposal repair in Maricopa, Schedule Garbage Disposal Repair Services with Jason the Plumber. I needed a water heater replaced but I really kind of wanted something better then what I had, which was a stock 50Gal Electric Bradford white. Good unit, but nothing extraordinary. I started a spreadsheet to evaluate about a dozen plumbing outfits. After some online research I dropped this to just five. Jason won and I am very pleased with the results. It took a while to get a hold of someone, however after about a month of back and forth they were able to help me find exactly what I wanted. Once that was take care of and the supplier issues were resolved (I wanted something special) they were able to move things around and schedule me for just a few days out and installed a very nice hybrid heat pump unit for under half of what anyone else was quoting. We’ve used Jason a couple of times, always on time, affordable, and does quality work. Much like another reviewer he helped us with a toy flushed down a toilet by a child. He even took care of a couple of minor things while he was here at no extra charge. Best Plumber in the Valley!! Great service! Always has your best interest in mind and treats your stuff like it’s his own. Needed help with shower repair. Cartridge got stuck inside and couldn’t get it out to replace. Called Jason morning, he was here within few minutes and fixed it. Shower is back to normal and working condition in no time. Highly recommend!! We had an upstairs toilet that would cause water to leak out a light fixture in our kitchen downstairs whenever the toilet was flushed. One plumber I called was concerned it would be a bigger issue and recommended I call Jason in case it was. He came out the same afternoon that I called. He did a great job repairing, was very quick and efficient, and I was impressed that the price was so reasonable. Glad to have a plumber to call on when I need one in the future! My wife and I needed a plumber ASAP. The water closet on our toilet had cracked and was leaking water all over the floor. I was unable to shut off the water valve for the water closet and had to shut off the main house water supply. I received Jason’s name from a close friend. It was already after 5 pm and was hoping he would answer and be able to respond. Jason answered and advised he would be there ASAP. When he arrived it looked at the situation and went to Home Depot to get what he needed. A couple hours later the problem was solved. I was expecting a large bill for what I considered to be an after hours service call but to my surprise the bill for labor and parts was extremely reasonable. Jason was very friendly and professional. I would strongly recommend Jason for all your plumbing needs. We heard about Jason through a mutual friend. Not only did we have leaking pipes out in front of our house, but one of the valves there was just about shut and sealed off water from an entire wing of our house. Jason got right on it and repaired the broken valves we had quick. He was great to work with and his prices were very fair. He even gave us a one year warranty on parts and labor. Before meeting Jason, I called another (apparently highly Yelp rated) plumber about the problem of the water not working in part of the house, and I kept getting advice from them about checking the screens on the faucets or whatever. Jason didn’t give me this BS–he just solved our problem. Here’s another small, local business that I can recommend to you, and I couldn’t recommend it more highly. Got a plumbing problem? Call Jason. Excellent plumber I will forever call Jason when I need a plumber again. Jason is incredible and has helped us with plumbing needs multiple times at our home here in Laveen. Thank you Jason!!!! If you are searching for an affordable plumber in Maricopa, AZ, then call us today at (623) 734-8072 or (480) 834-3373. View our 5 star plumber reviews on Google. View our 5 star plumbing reviews on Yelp. We are available 24/7 for plumbing emergencies in Maricopa, so you can reach us at any time that you have a plumbing issue. We have technicians on hand for a quick dispatch and who will work efficiently to get your plumbing problem fixed in a flash! Are you searching for “common plumbing problems” in Maricopa, AZ? If so, this plumbing repair guide should help! If you are searching for a trustworthy yet affordable plumber, then call us today at (623) 734-8072 or (480) 834-3373. View our 5 star reviews on Google. View our 5 star reviews on Yelp. We are available 24/7, so you can reach us at any time that you have a plumbing issue. We have technicians on hand for a quick dispatch and who will work efficiently to get your water heater up and running again.